Hello Everyone! 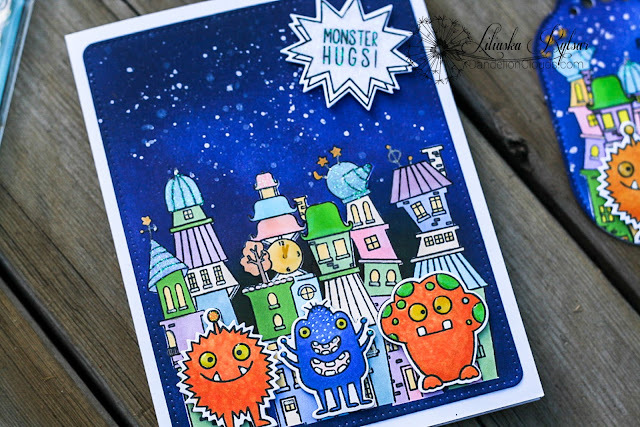 I have a Monster Birthday Card and Tag set to share with you today. 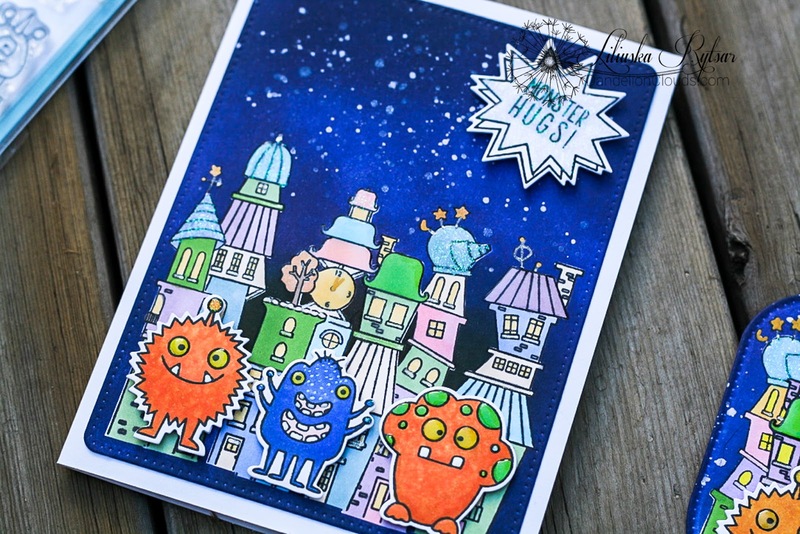 I combined two Studio Katia stamps sets - Whimsical Town and Monster Bash - to create a fun scene. And I have to admit I do like this set a lot, especially all the sparkles... But let me tell you how I made the card before I tell you about all the finishing touches. First I stamped three monsters on a panel I die cut with a die from Dotted Patterns Set 3. This set my latest favourite and I don't even put these dies away I use them so often. After stamping the monsters I covered them with masks and started stamping buildings. I covered all stamped images with masks (I did get carried away lol) and started working on the background. I used distress inks in blue and purple shades to make this intense night sky. To brighten it up a little I added some splashes with white and golden shimmer pens. And once I did that I knew right away what else did my scene need after I coloured all the images with alcohol markers. A lot of sparkle! 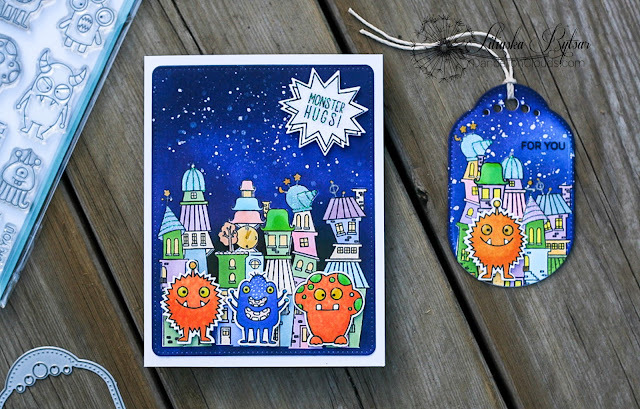 I used Nuvo Crystal Glaze on couple roofs, monsters' eyes and one of the monster's head. 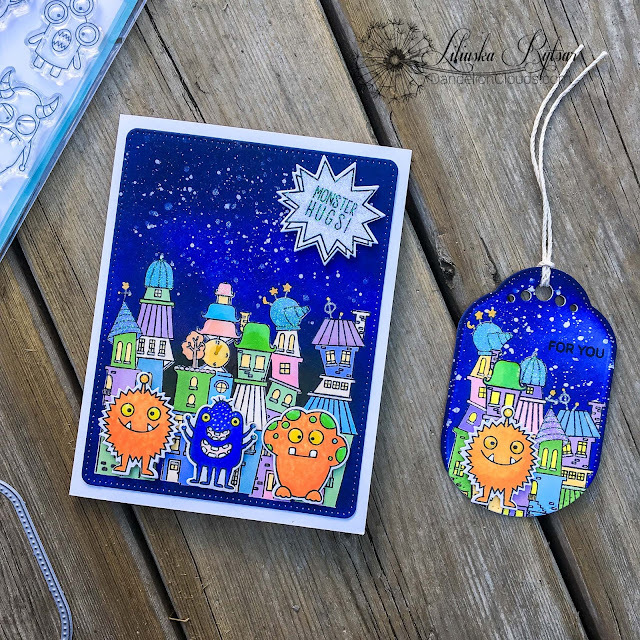 I used Nuvo Glitter Drops to cover a star-shaped sentiment and couple roofs. I also used a clear glitter pen to highlight some small details on whimsical buildings. Once everything was dry, I foam mounted the sentiment and three monsters. 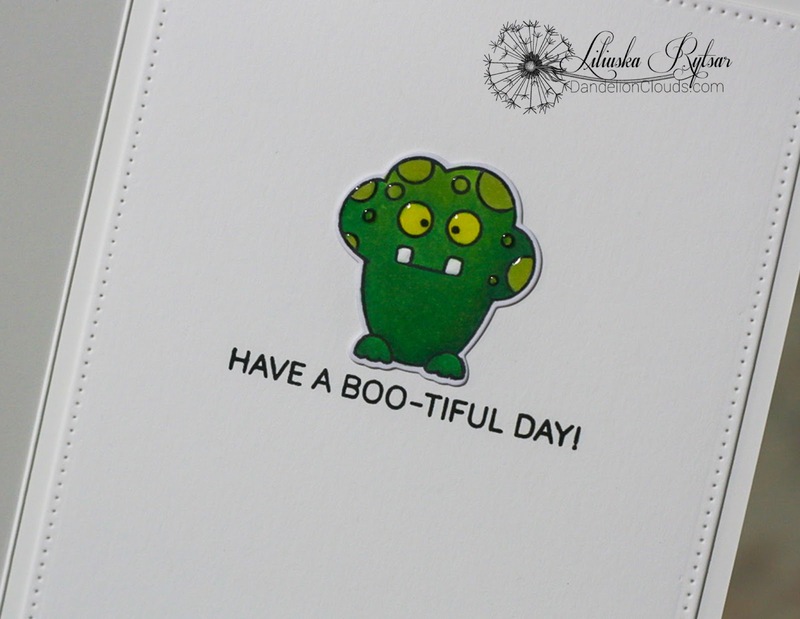 And since I coloured more monsters than I needed, I decided to add one inside of the card. I couldn't resist making a matching tag. Usually I make two cards that look similar, and are different at the same time. 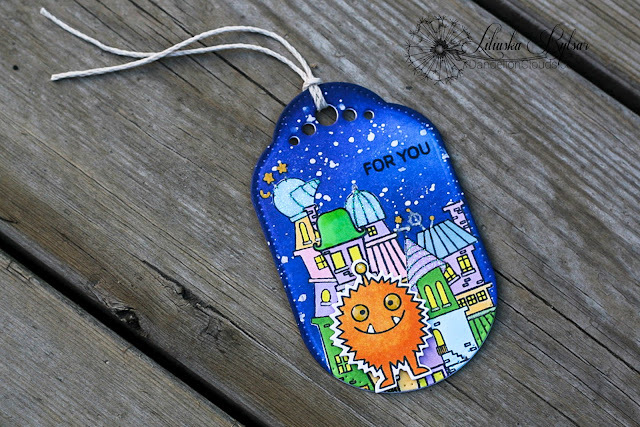 Lately I am into making matching tags. I just can't get enough of that cute tag from Dotted Patterns Set 3. You will definitely be seeing more of card and tag sets from me in the near future. ;) I just love how this little guy turned out! Hope you were inspired by my projects today! Have a great weekend!